(TibetanReview.net, Jul31, 2018) – China is employing its nationwide campaign against organized crime in Tibet to specifically target suspected political dissidents, even suppressing civil society initiatives and traditions, said New York-based Human Rights Watch in a 101-page new report released Jul 30. 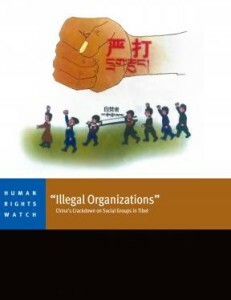 The report, “‘Illegal Organizations’: China’s Crackdown on Tibetan Social Groups,” details efforts by the Chinese Communist Party at the local level to eliminate any remaining influences of lamas and traditional leaders within Tibetan communities. The report features in-depth interviews and uses cartoons to depict the new restrictions, and cases of Tibetans arbitrarily detained for their involvement in community activities. Under the new campaign, “authorities can prosecute people for simply gathering for any purpose not directly mandated or approved by the state,” Sophie Richardson, China director at Human Rights Watch, has said. Following a campaign launched nationwide, the Public Security Bureau of the Tibet Autonomous Region in Feb 2018 published a circular which listed newly defined forms of so-called “organized crime”. It was stated to be the first set of such prohibitions to be announced at the provincial level. The circular’s bans included any initiative for the promotion of local language and culture, and protection of the local environment, which China sees as activities showing support for the exiled Tibetan spiritual leader, the Dalai Lama, and therefore subversive. Likewise, traditional forms of social organization, such as the mediation of community and family disputes and community welfare funds, are characterized as organized crime, the report finds. The report has found that the criminalization of innocuous forms of social activism had been official policy in some Tibetan areas since 2012. Under it there have been numerous detentions and prosecutions of community activists, and closures of privately organized local schools and other self-help groups. Local regulations from Chamdo Municipality in the Tibet Autonomous Region and Malho Prefecture in Qinghai Province ban any “group with more than five members” formed without official permission, and declare any popular initiative for the promotion of Tibetan language, culture, and religion, or for protection of local environment and wildlife, to be agitation for Tibetan independence and collusion with “foreign anti-China forces”, the report says. 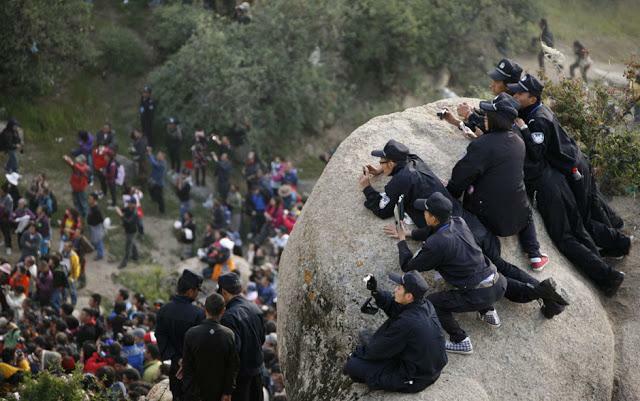 The group accuses China of systematically violating universally recognized rights to freedom of association, peaceful assembly, expression, and participation in the cultural life of the community in the Tibetan areas. The group calls on the Chinese government, Party officials, and state security forces to immediately end their unjustified interventions into the creation and conduct of independent social associations in Tibetan communities. It also calls on concerned governments and UN bodies to publicly urge China’s leaders to reconcile the laws and policies restricting the rights to freedom of expression, peaceful assembly, and association of the Tibetan people with their claims to respect the rule of law. It wants these concerns to be also expressed at the Aug 2018 review of China’s record of compliance with the International Convention on the Elimination of All Forms of Racial Discrimination at the UN.